MANILA -- After long delays in its passage, President Rodrigo R. Duterte has finally signed the 2019 national budget, Malacañang said on Monday. Executive Secretary Salvador Medialdea confirmed to reporters via text message that the budget has indeed been signed by the chief executive. Medialdea said the President, however, vetoed PHP95.3 billion worth of appropriation since they are “not part of the President's priority projects”. “The President, among others, vetoed 95.3 billion pesos items of appropriations in the Details of DPWH (Department of Public Works and Highways) Programs/Projects, which are not within the programmed priorities,” Medialdea said. Earlier, Senate President Vicente Sotto III said he will support a presidential veto of the entire national budget if he should find irregularities in the measure. Earlier, delays in the passage of the 2019 budget stemmed from an impasse between the two members of the Congress after last-minute amendments made by the House ratification of the bicameral conference committee report. Presidential Spokesperson Salvador Panelo earlier said Duterte has the right to veto certain realignments and would not sign anything "unconstitutional". 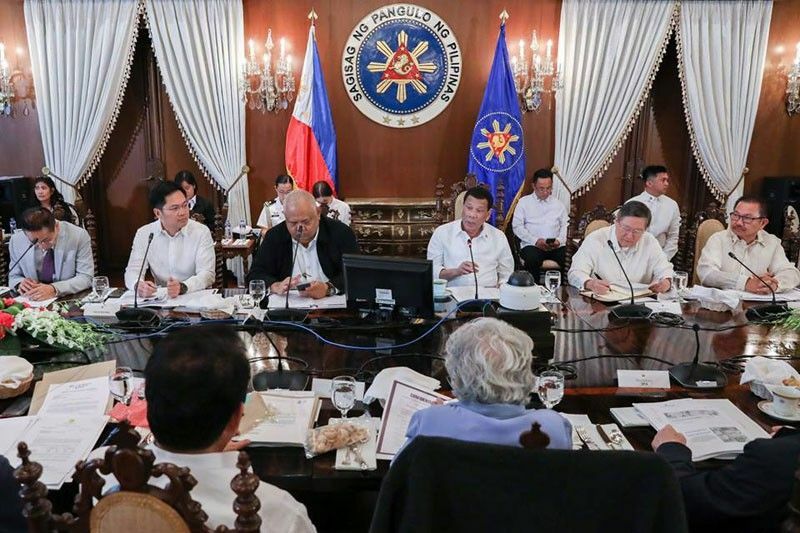 On April 10, Panelo announced that the President will sign the 2019 budget. However, it was later rescheduled until further notice.